A while ago, Mia picked up a copy of Deborah Madison's "Vegetable Soups." It's a beautiful book, with lots of vibrant, colorful pictures, and lots of recipes for vegetable soups. I like soup a lot, and I especially like making vegetable soups, because they're easy, they look good, and they're delicious. They require no particular skills, and they're basically impossible to mess up. Plus, I like chopping vegetables, which is usually required in large quantity. 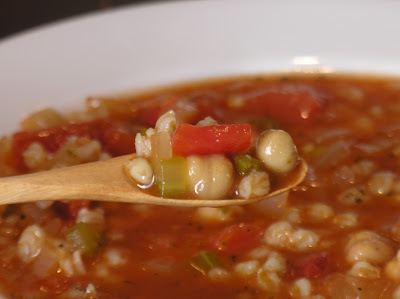 The first soup that we chose to make from the book (and which we have re-made several times) is the summer version of the farro soup. We had just bought some farro in California for half the price that Whole Foods in Cambridge charges, so we were eager to make something with farro. 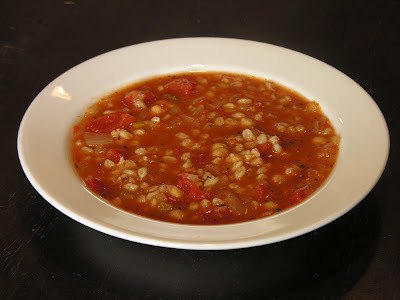 In addition, the winter version of farro soup in the book is basically the same as the summer version sans tomatoes - why leave out the tomatoes when you can add them? As in all of the vegetable soups I have made, you begin this one by chopping up an onion, carrots, and celery and sauteing them in olive oil. Then you add tomato paste and fry it for a little while. Next comes tomatoes, then water and pre-soaked farro. At the very end, you add a can of chickpeas. Deborah insists that, unless the chickpeas are organic, you should dispose of the liquid, but I consider that to be, if not pretentiously green, at least overly cautious. Then again, I don't wash my produce carefully, and I strongly prefer charcoal grills, so maybe I'm just asking for trouble. As usual with soup, the most important thing is to make sure there is enough salt in it. Luckily, if there isn't enough salt, the solution is quick and easy - add more. The same is true with other seasonings. Mark Bittman had a recent post that suggests that the timing of salt addition is not nearly as important as people think, and I trust Mark Bittman, so I don't worry too much about under-salting the soup at first. As you can see from the pictures, the tomatoes give the broth a nice red color, and the various vegetables give lots of pleasing contrast. The soup is best served warm, of course, but when we make a gallon of it, Mia and I usually can't resist taking it out of the fridge and gorging on it cold right out of the used yogurt containers that serve as our Tupperware. It never lasts very long.